Whether gracing a party platter, a picnic or simply stuffed into your mouth for a delicious snack on the go, sausage rolls are a guilty pleasure for so many people. Like Scotch eggs, the sausage roll has enjoyed something of a renaissance recently and experimental flavours can often be found on the snack menus of gastropubs and restaurants. Whether they're sprinkled with fennel seeds, packed with unusual fillings or made without meat altogether the fundamentals of a sausage roll will always remain the same – juicy, well-flavoured filling encased in gloriously golden pastry. This collection of sausage roll recipes contains plenty of varied ideas, whether you're catering for the masses at a Christmas party or looking for gluten free or vegan sausage roll recipes. Georgina Fuggle brings out the juicy flavour of the pork meat with the addition of apricot and fennel seeds in her easy sausage roll recipe, while James Mackenzie opts for juniper berries to complement his Partridge sausage rolls. 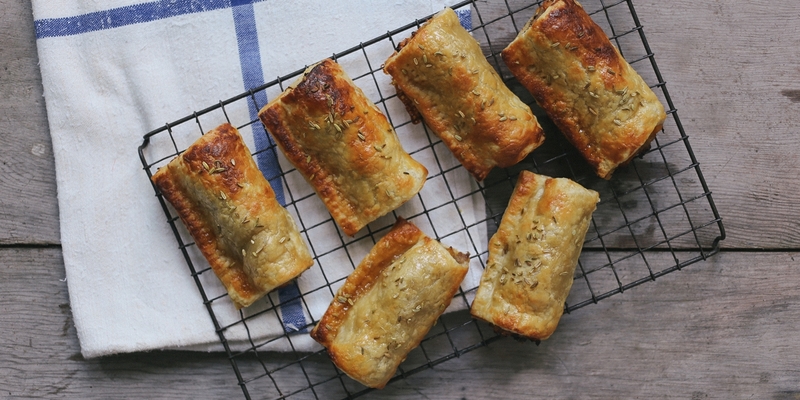 Victoria Glass makes her sausage rolls with gluten-free pastry, or for guests avoiding meat and dairy Jacqueline Meldrum's Vegan sausage rolls would be the perfect treat to offer.